It is a constant in our lives. We see it from our bedroom, on our commute, and from the embassy. It sits quietly in the near distance, yet that potential for catastrophic eruption persists. It is impossible to be in Quito and not be drawn to its beauty. Cotopaxi is an iconic volcano, one that occupies a central part of Ecuador’s identity as a destination of natural wonders and adventurous spirits. Reaching nearly 6,000 meters into the sky, Cotopaxi is the second highest peak in Ecuador and one of the tallest volcanos in the world. Unlike the ‘active’ volcano of Pululahua, Cotopaxi was actively erupting from September 2015 until January 2016. This most recent eruption cycle caused mass evacuations of nearby towns, extensive emergency preparedness drills, and not a few ruined car engines from the ash clouds. Luckily a full fledged eruption didn’t occur, but the national park was closed at the time and the summit remains closed. Eruptions of Cotopaxi would be disastrous due to the lahar mud flows that would follow. Basically an eruption would flash melt the glaciated peak and the resulting fast moving mud would engulf all surrounding areas, especially along the various river valleys. Past eruptions have twice completely destroyed the provincial capital of Latacunga and lahar once even made it to the Pacific Ocean more than 100km away! Most scientific models show the lahar flowing in the river valley immediately below our neighbourhood – about 50 km from the summit of Cotopaxi – with enough force to do significant damage. It is a form of nature that we would rather not see or experience. Cotopaxi is a temptress though. It is a mountain with sacred ties to the indigenous cultures in the area – including beliefs that gods lived at the summit and it being sacred as a form of rain producer. That reputation for rain is not unfounded. 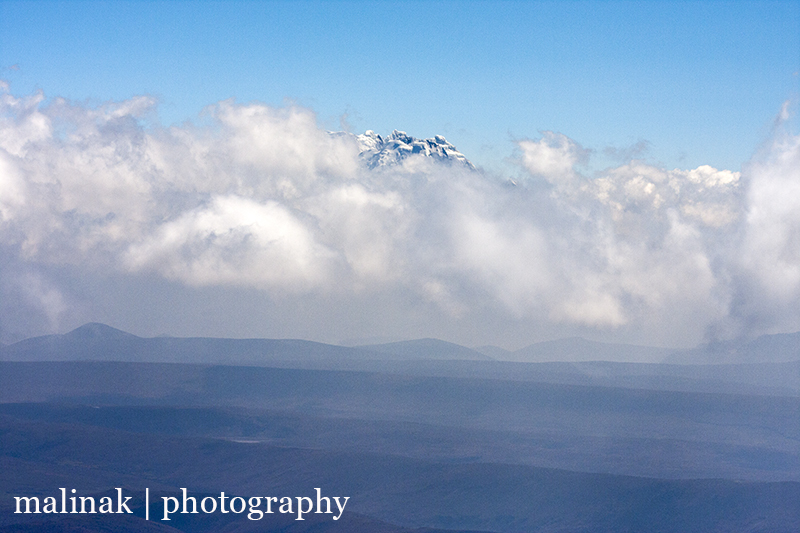 A completely clear day, all day, around Cotopaxi is exceedingly rare. There are constant changes to clouds and light conditions, with rain, wind, sleet, hail, and snow all being common occurrences in the same day. The best conditions tend to be first thing in the morning or around sunset. Because of this we commonly inform guests that if the volcano is visible at first light, and clearly so, then we will rouse them and get them in the car by 7am in order to get to the park in time to see the summit properly. 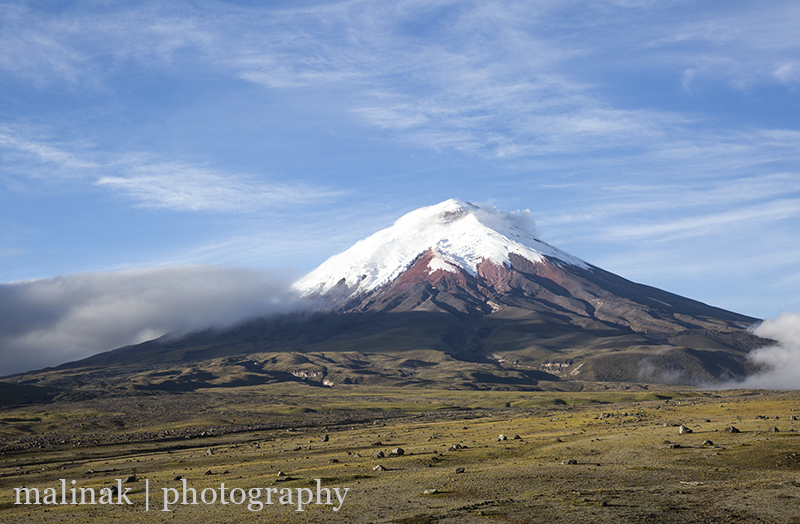 The drive to the entrance of Cotopaxi National Park is only about an hour from Quito. After a short drive through some evergreen forests, you enter the rock strewn plains around the base of the volcano itself. Here there are great hikes available especially around Limpiopungo Lake or a well hidden spring fed stream on the backside of the park. The true draw however is the road up the volcano to the carpark at 4,600 metres above sea level. Here the dusty slopes and intense winds can make walking rather difficult. For the more hearty you can walk up to the refugio which sits at 4,900 metres. This is currently the highest up you can go, but it used to be the key jumping off point for climbers attempting to summit Cotopaxi. The snow line is usually above the refugio, but after extended periods of particularly wet weather, the snow descends down to the carpark. We had a particularly fun family outing during one of these times – complete with michelin baby Piper! Most people drive up and down from the carpark, but there are tour operators who will drive you up and then give you a mountain bike to descend the rutted dirt road. Some really go for it on the descent and others appear out for a Sunday ride. Either way it looks like a great way to experience the volcano and environs. Of course there is the option to walk, or even run down as well, and with our good friend Thierry, I did run down quite a ways. It is only a downhill run that is possible at that altitude – going up would require excessive amounts of training! There isn’t a ton of flora and fauna up at that altitude, but the ground is covered in a wide array of flowers, lichen, moss, and grasses. Little spurts of reds, yellows, and blues pop out from the white lichen to add colour and texture to the plains. There are over 800 wild horses in the park along with foxes, deer, rabbits, lizards, and of course birds of prey circling – maybe for gringos stupid enough to run down a volcano! 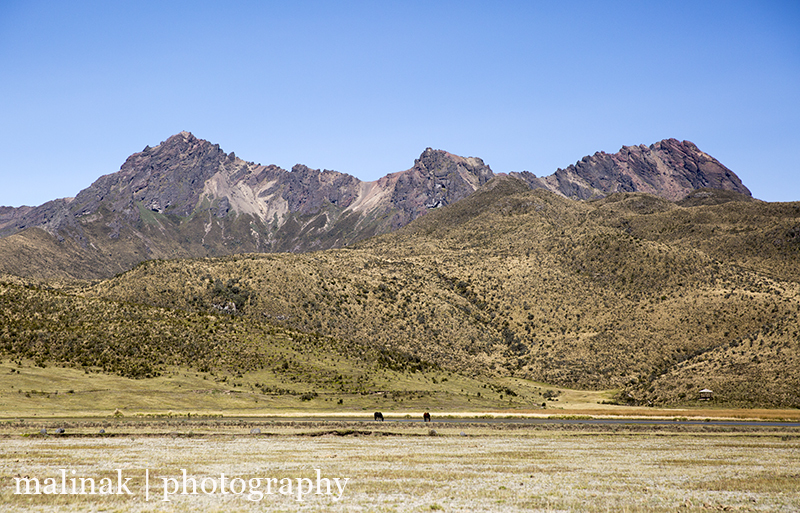 Beyond the aforementioned 800 wild horses, there are numerous options for horseback riding in, and around, the park. No matter whether it is an hour plod or a full day excursion, horse riding in the park is quite something. Cora and our friend Ruth went on a lovely hour ride from Tambopaxi, with me acting as a horse for Piper as she rode in her backpack alongside! Although the weather was quite overcast, it was lovely to wander out amongst the undulating terrain and really feel the true size and power of Cotopaxi. The ride took us off into some of the hidden corners and dry river beds that would be filled in seconds should an eruption occur. It was hard for this two legged baby pack heavy horse to keep up, but all in all we had a fantastic time. 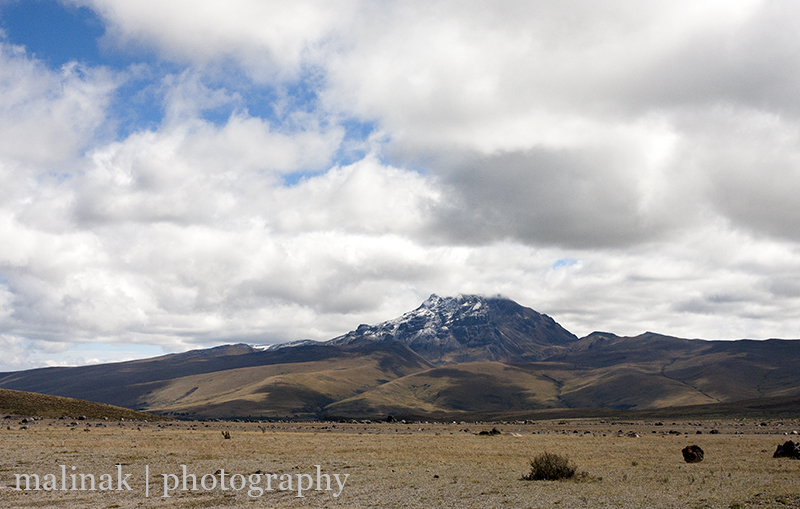 You would think a behemoth like Cotopaxi would be sufficient to capture anyone’s attention, but there are actually several other volcanos surrounding, usually easily visible from the park. 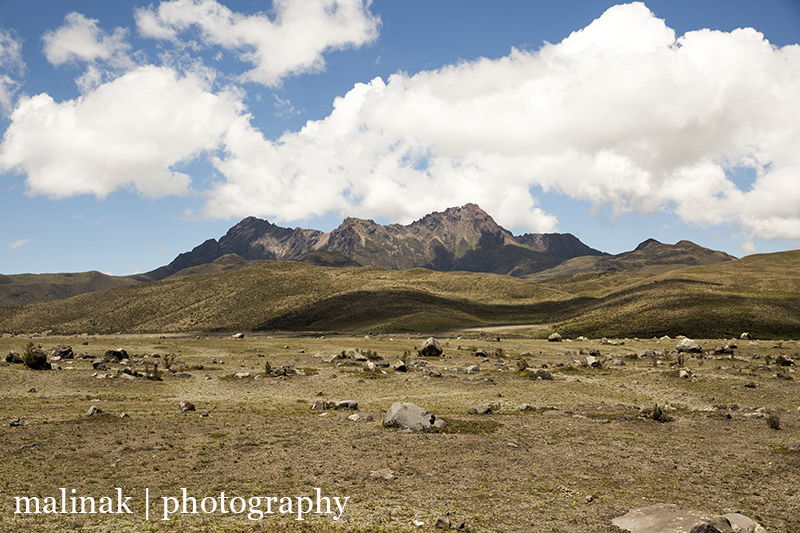 Ruminahui – a jagged dormant volcano reaching over 4,700 metres – sits overlooking Limpiopungo Lake. 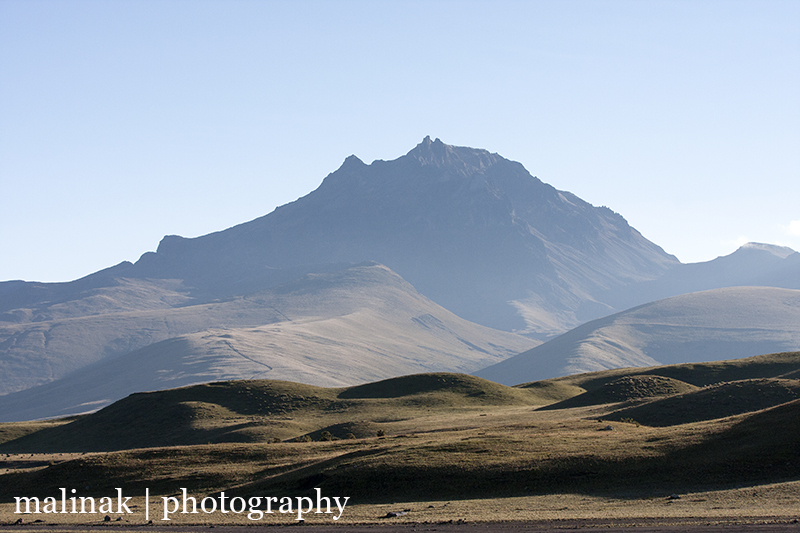 Sinchalagua – an imposing 4,900 metre high peak is also easily overshadowed by its more famous neighbour. 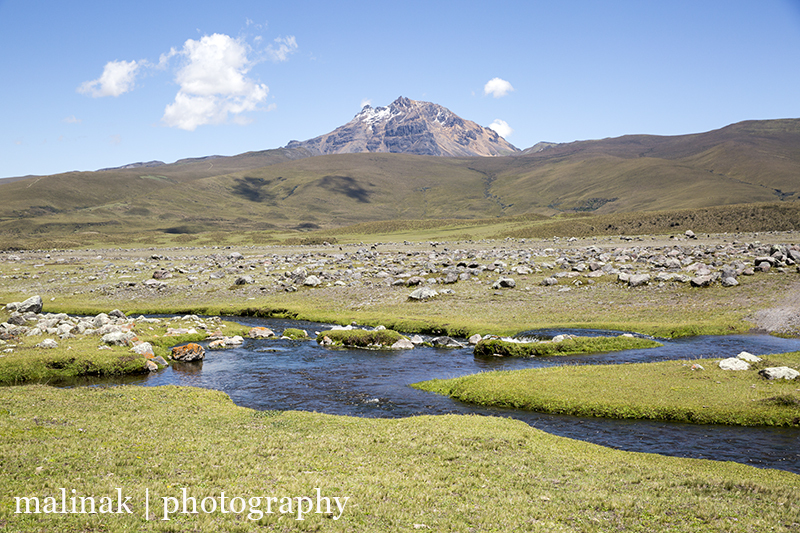 On clear days, Antisana, the fourth highest peak in Ecuador, is also visible as are numerous other peaks in the area. There are camping sites in the park, but only one indoor sleeping option – Tambopaxi. This haven for climbers is very comfortable and is on the track to the more rugged northern entrance to the park. 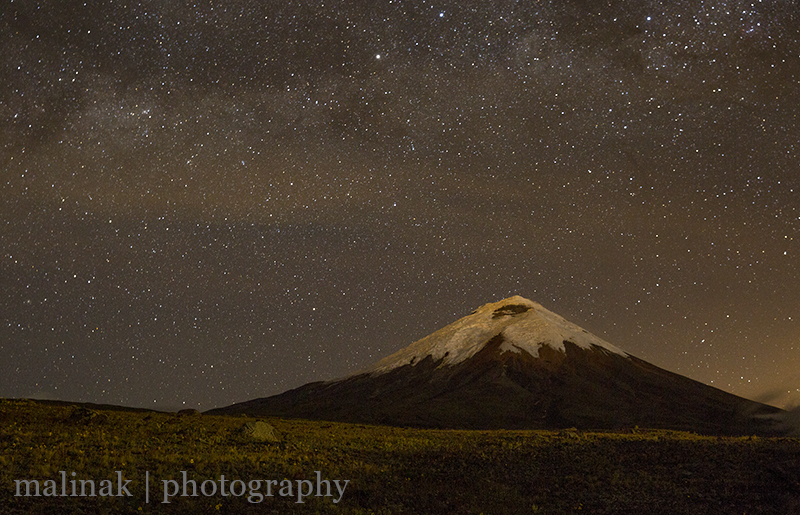 Being in the park itself means that on a clear night or morning, you can go out and experience the star strewn sky over Cotopaxi or watch the sun come up. Both are truly magical to experience. Outside the park borders are numerous other options – our favourite little find is La Campiña – a small little farmstead with wonderful owners (post to follow soon). Cotopaxi is majestic and magnificent. Not a single day goes by where we don’t look for it. Sometimes I will wander out our front door for no other reason than to look southeast and see if it is visible. If it is, I will usually stand and look at it for awhile, immune from the visual distractions of the neighbouring houses and suburban detritus. The park itself is one of our favourite places in Ecuador – rugged, largely empty, and with the mountainous surroundings that feed our souls. You can have spectacular experiences throughout Ecuador, but not visiting Cotopaxi would be to deprive yourself of the opportunity to truly experience the unique and amazing wonders of nature. Rain or shine, make an attempt and it will truly astound you. Thanks to all of our friends and family who have helped us to have so many opportunities to visit this majestic beauty — Aarne, Mom, Heather, the Brooke family, the De Saint Martin family, Mom and Dad and Ruth!